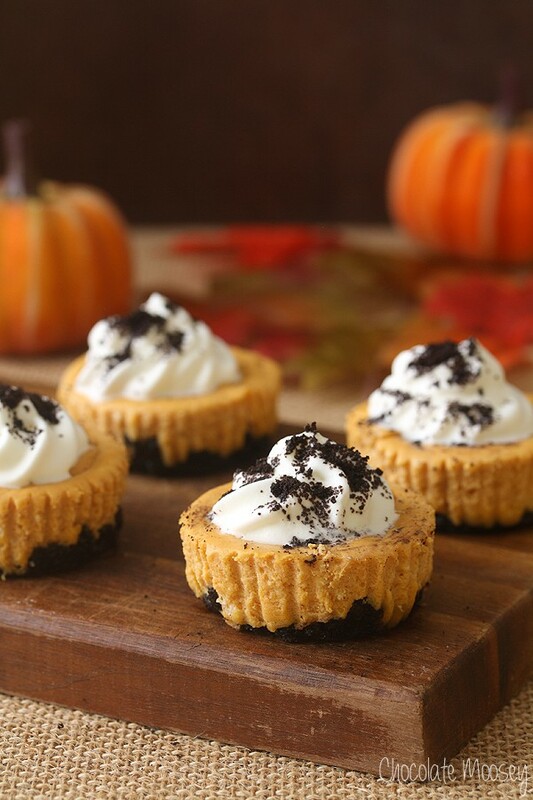 Mini Pumpkin Oreo Cheesecakes are festive little treats without too much fuss. Serve this black and orange dessert for Halloween or as an alternative to pumpkin pie for Thanksgiving. When it comes to decorating desserts for the holidays, well, let’s just say I know my weaknesses. Some bakers are a natural at decorating. They can pipe buttercream roses, turn cupcakes into pumpkins, and flawlessly pipe royal icing onto sugar cookies. Mine usually look like a five-year-old made them. 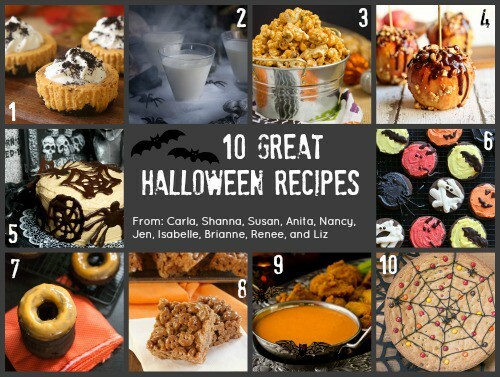 With Halloween coming up in a few weeks, I, along with a group of talented food bloggers, wanted to share something festive. I am not a spooky Halloween kind of girl. I don’t like gore. I don’t like fright. I like cute black cats that like to cuddle and jack o’ lanterns with funny faces. Certainly no spiders. 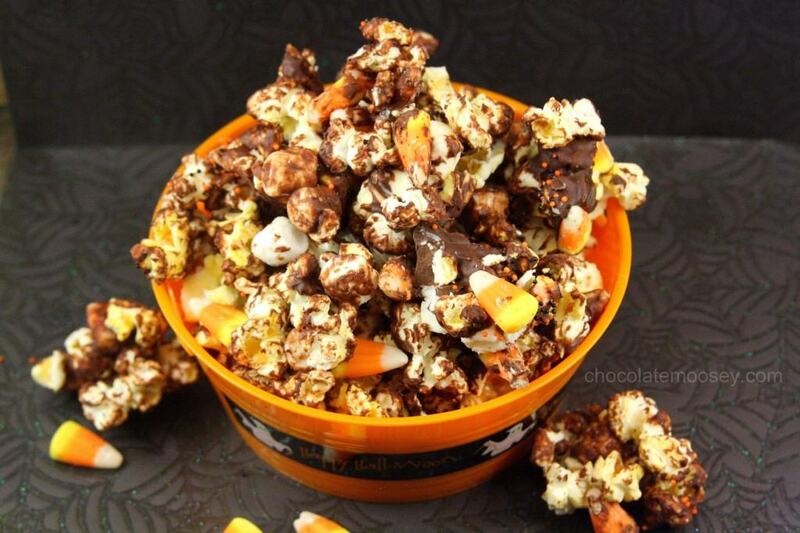 I’ve already made rice crispy treat pumpkins, candy corn cupcakes, cheesecake truffles, and candy corn popcorn. 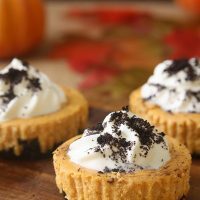 This year I decided to stick with my baking strengths and make Mini Pumpkin Oreo Cheesecakes. 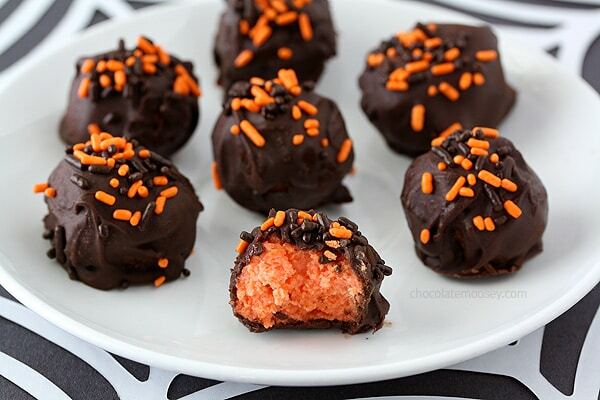 Not only are they black and orange for Halloween, they make a great Thanksgiving dessert too. Oops did I say the T-word before November? Ahh well hopefully you can forgive me after you eat a few (dozen) of these cheesecakes. Do you go all out when decorating for Halloween? I certainly don’t. There are a few houses nearby who fully decorate their yards, complete with full-sized scarecrows and skeletons. The most I’ve done is hang a black cat windsock on my balcony. I’m usually terrible at taking decorations down in a timely manner, so if I were to go all out, they’d probably be up until Christmas. Merry Halloween? 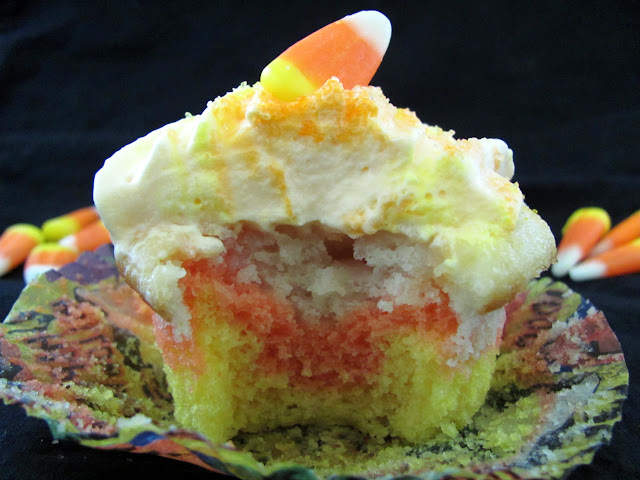 I’ve made cheesecake cupcakes in the past but wanted these to be pumpkin cheesecakes only; no cake. I baked them in cupcake liners for easy removal and clean up then peeled off the liners before serving as I prefer them without. If you’re serving to a crowd, it may be more sanitary to leave on the liners. They do crack a little on top after cooling, but since you are piping whipped cream on top, it really doesn’t matter (and if somebody does complain, say you’ll take care of that then eat his/her cheesecake. Problem solved). 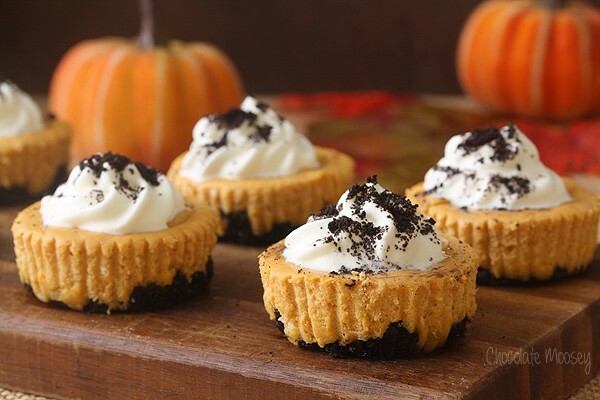 These mini pumpkin cheesecakes are very creamy and taste like heaven. I really like how they turned out black and orange because not many foods can give you that natural black look. I’m not opposed to food coloring, but my hands get very, uh, colorful when I do use it. 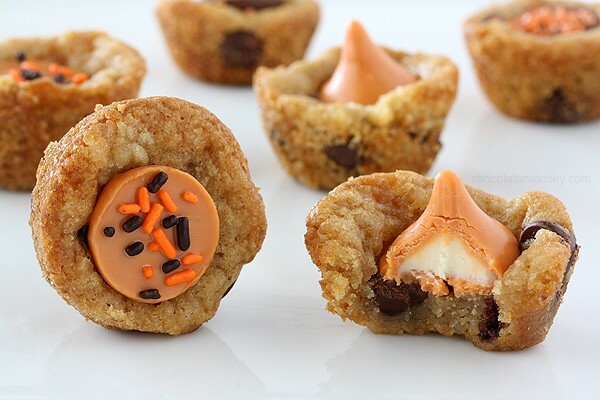 If you’re feeling super decorative, you can make little jack o’ lantern faces on top instead of piping whipped cream. Preheat oven to 325F. Line a cupcake pan with 9 paper liners. In a small bowl, mix together the cookie crumbs and melted butter until moistened and clumpy. Press down into the bottom of each paper liner. Bake 5 minutes. In a large mixing bowl, beat together the cream cheese, sugar, and cinnamon until smooth and creamy, about 2-3 minutes. Beat in the egg then beat in the sour cream, vanilla, and pumpkin. 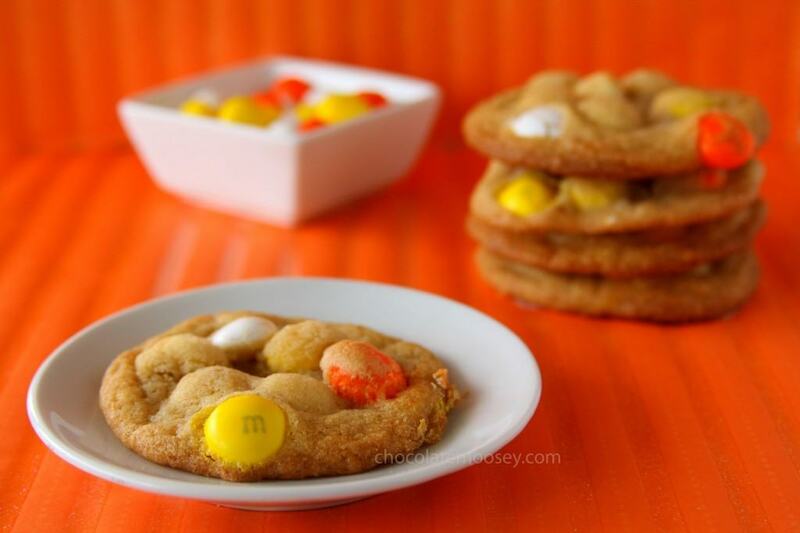 Pour over the baked cookie crusts and bake 20-25 minutes or until a toothpick inserted in the center comes out clean. Cool completely at room temperature then chill in the refrigerator for at least 4 hours. Right before serving: In a medium bowl, beat the cream until soft peaks form (when you pull the beaters straight up, peaks form but fall over). Gradually add the sugar and continue beating until stiff peaks form (peaks form but don't fall over). Remove the paper liners from the cheesecakes, if desired, and pipe the whipped cream on top. Garnish with cookie crumbs. Serve immediately. Store ungarnished cheesecakes in the refrigerator for up to one week. Oh, man, do these look DELISH! And so easy to pop in my mouth, one after another!!! Perfect Halloween treat. You’re just like me, I don’t do cute food either. Practical yes, delicious absolutely, cut no. These cheesecakes are right up my alley! I couldn’t resist reading this post. 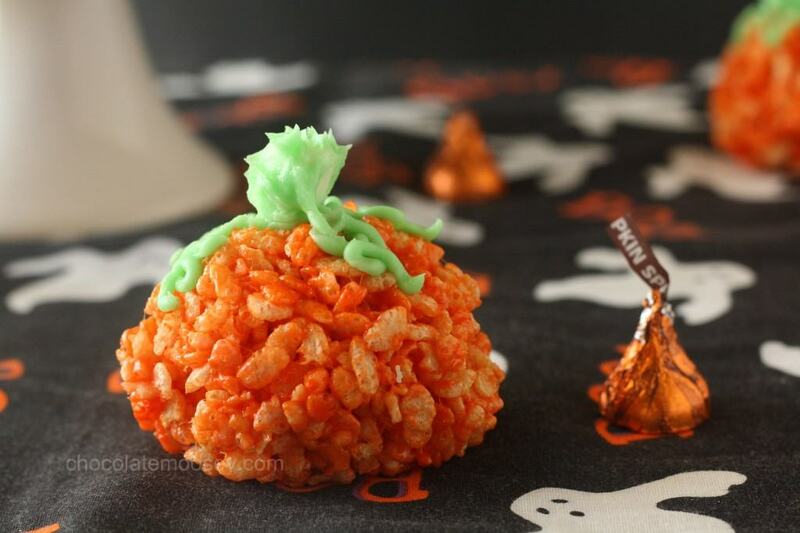 What special charming Halloween treats. Waaaaaay too good to waste on a kid. I am laughing here. This is an adult treat!!!!! You are the cheesecake queen!! So there is really no problem with removing the paper liners from the cheesecakes? I want to try this, but I can picture the mess if the liners stick! Nope, no problems for me! I used paper liners (I believe from Reynold’s Wrap) and nothing stuck. It might depend on the quality of the liners too. If you think they might stick, you can (very very lightly) spray the liners before filling. I don’t mind a little scariness but I don’t like gore. But as far as I am concerned, i would much rather be in the haunted house than walking though it! 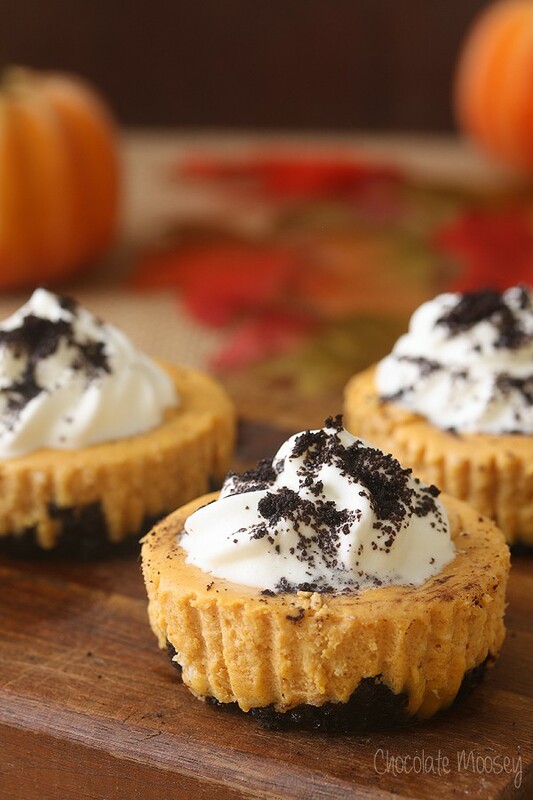 Love your mini pumpkin Oreo cheesecakes, Carla! Perfect for a Halloween party or, yes, I’ll say it too, Thanksgiving. #teamspoon has to stick together. And that’s what I’d be eating these with. What size can of pumpkin did you use?! I am looking forward to making these lovely treats! Duh! For some reason I just read 1/2 of a can, not 1/2 cup! My bad, thanks for the quick response ! Do you mean as whole cookies instead of crumbs? I haven’t personally tried it, but I don’t see why not.